(Rick Egan | Tribune file photo) Newly elected county officials are sworn in by Judge Hazleton at the San Juan County Courthouse in Monticello on Monday, Jan. 7, 2019. Left to right they are: Greg Adams, John David Nielson, Bruce Adams, Kenneth Maryboy and WIllie Grayeyes. State Rep. Phil Lyman says the court-ordered redistricting that gave the county commission its first Navajo majority disenfranchised voters in Blanding. He's saying the idea of a county split should be debated. “I’m not necessarily a proponent of doing it, but I’m certainly a proponent of having that option on the table and not making one group feel like they’re at the mercy of someone else or held hostage,” Lyman, a Republican, said. Lyman has objected that the judge’s map broke Blanding into three districts, diluting the largest San Juan city’s influence in picking one of the county commissioners. The new boundaries gave Navajos, who slightly outnumber whites in the county, the voting power to elect two tribe members to the three-member commission last year, for the first time in San Juan’s history. 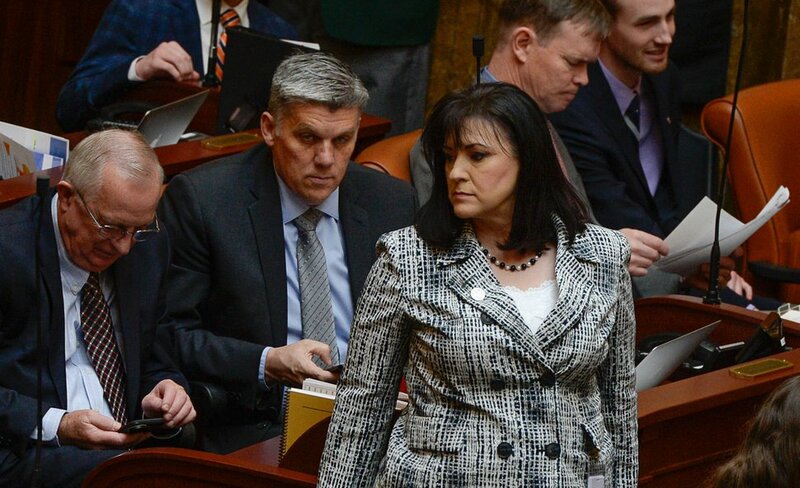 (Francisco Kjolseth | The Salt Lake Tribune) Rep. Kim Coleman, R-West Jordan, sponsor of HB93, county formation amendments, would let counties split. Rep. Phil Lyman, R-Blanding, center left, is in favor of the bill. Lyman said the changing power dynamic isn’t the reason he’s talking about dividing the county. But “chopping Blanding up into three pieces” has left that community feeling aggrieved, said Lyman, whose legislative district is three-quarters white. The court order that led to last year’s special election has been fought tooth and nail by Republicans. The county has an appeal pending on the decision and during the election, the county clerk kicked one Navajo candidate, Willie Grayeyes, off the ballot for allegedly violating nonresidency rules until he was reinstated by a federal judge and went on to win the election. The clerk’s action in backdating a complaint to allow an investigation to go forward remains under review by a prosecutor. Talk of county split doesn’t surprise Mark Maryboy, a former San Juan County official who says some of the whites who have long held sway are threatened by the Navajo-dominated commission. He does not believe fracturing the county would be good for residents at this point. “The people are already somewhat divided. I think if that happens, there’s going to be further division, and both sides will suffer,” said Maryboy, a community activist and former four-term county commissioner. Meanwhile, Lyman is supporting state legislation designed to give communities more agency in forming new counties. As it stands, a proposed secession must be approved countywide, by voters on both sides of the split; Rep. Kim Coleman wants to change this law so the decision falls only to residents in the area considering independence. Coleman, R-West Jordan, said the nation has a rich tradition of allowing citizens to choose their governing leaders, dating all the way back to the American Revolution. "We didn't ask King George's permission. We said we were leaving," Coleman said. She said she’s advancing the legislation on the principle that communities should be self-directed and not to promote a particular split, although she has heard of interest in dividing Salt Lake and San Juan counties. The statutory process for forming a new county is somewhat rusty, with the century-old Daggett County the state’s youngest jurisdiction. But the first step is a petition drive, followed by a special election if enough signatures are gathered. Some Daggett residents say the split from Uintah County never should have been allowed because it left the former county — the state’s smallest with a population of about 1,000 — with an unsustainable economy. San Juan County is the state’s 13th most sparsely populated, with about 15,350 residents. It is the poorest area of Utah, with one of every four residents living below the poverty line. Poverty in the Navajo portion of the county has a poverty rate close to 50 percent, much higher than in other areas, former San Juan Commissioner Rebecca Benally, a Navajo, told The Salt Lake Tribune recently. Coleman says the Legislature’s signoff is also required (while the need for legislative approval isn’t spelled out in the law, she said it’s implied by a constitutional provision that classifies counties as “legal subdivisions of the state”). Her bill, HB93, last week won a favorable recommendation from the House Government Operations Committee, over the objection of two Democrats on the panel. Reps. Patrice Arent and Jennifer Dailey-Provost said they’d be nervous about zeroing in on a single part of the county formation process without taking a more holistic look at it. For instance, they wondered about letting communities split off without giving those left behind a chance to weigh in on the changes, which might have a deep impact on their tax base and the financial health of their local government. These concerns are echoed by the Utah Association of Counties, which has taken a position against Coleman’s bill. The potential for creating inequities came up in the 1990s during a previous discussion about segmenting San Juan County. A University of Utah study commissioned by the county determined that dividing could economically cripple the Navajo portion in the south, the Deseret News reported in 1997. Lyman said since then, the tax base on the northern end of the county has been “dramatically diminished,” so the two sides are more comparable. Maryboy was on the commission when the university’s study was conducted and said that at the time, relations were strained between the white and Navajo parts of the county. But now, there’s reason for hope, he said. Blanding’s mayor, Joe Lyman, said he hasn’t studied the idea of dividing San Juan enough to offer an opinion, although it could be examined. Bruce Adams, a San Juan County commissioner, didn’t want to share his opinion on county division, saying he didn’t trust The Tribune to represent his viewpoint accurately. “The discussion should start with the County Commission. It shouldn’t be something that is started by The Salt Lake Tribune and then the County Commission discusses it after everyone has read the story,” the Monticello resident said. Grayeyes also declined to comment for this article, and the third San Juan County commissioner, Kenneth Maryboy, could not be reached.